We started using Intercom for the in-app chat. Pretty soon we started using it for everything else. Lead-nurturing mails, notifications, and even our customer behavior metrics are taken from Intercom now. 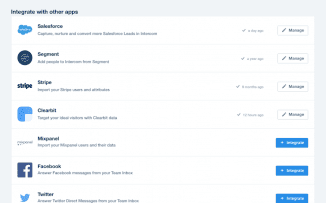 There’s too many features in Intercom and many new features keep getting added. A dedicated account manager would be great to identify our requirements. We would save time exploring other products. We started using Intercom for the in-app chat. Pretty soon we started using it for everything else. Lead-nurturing mails, notifications, and even our customer behavior metrics are taken from Intercom now. 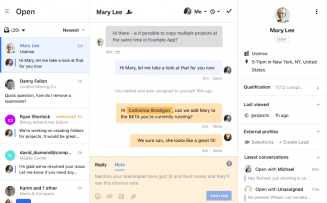 There’s too many features in Intercom and many new features keep getting added. A dedicated account manager would be great to identify our requirements. We would save time exploring other products. It packs serious power, allowing us to do comprehensive user engagement. It’s UI is squeaky clean and all the buttons are where you’d expect them to be. It does get more expensive as your business grows. You need to be prepared for that when you sign up. It packs serious power, allowing us to do comprehensive user engagement. It’s UI is squeaky clean and all the buttons are where you’d expect them to be. It does get more expensive as your business grows. You need to be prepared for that when you sign up. Being able to quickly and efficiently communicate with our customers is a big help. Allowing customers to chat in even when we are offline is also a great way to always insure that their issue or concern will always be addressed. I dislike that you have to purchase a separate installation for each website that you have if you want to customize the end-user experience to match the website they are currently on. Being able to quickly and efficiently communicate with our customers is a big help. Allowing customers to chat in even when we are offline is also a great way to always insure that their issue or concern will always be addressed. I dislike that you have to purchase a separate installation for each website that you have if you want to customize the end-user experience to match the website they are currently on. Easy to use, you can learn very quickly about almost all features. You can easily edit the information about your team, like work hours, automatic messagens, time to answer, segment your customers based on a lot of different features and create rules to automatize the communication. They take a few hours to answer in the customer service, sometimes It is not good to wait this time to solve some problem or have an answer from their team. Also I would like more options to create flows of automatic communications, also would be great to provide ways to calculate customer health scores and track this overtime. Easy way to integrate with my system and communicate with our customers. Easy to use, you can learn very quickly about almost all features. You can easily edit the information about your team, like work hours, automatic messagens, time to answer, segment your customers based on a lot of different features and create rules to automatize the communication. They take a few hours to answer in the customer service, sometimes It is not good to wait this time to solve some problem or have an answer from their team. Also I would like more options to create flows of automatic communications, also would be great to provide ways to calculate customer health scores and track this overtime. Easy way to integrate with my system and communicate with our customers. Intercom provides three different messaging-first solutions that offer modern internet businesses a complete platform to accelerate growth across the entire customer journey. Through their messaging platform, businesses can chat with prospective and existing customers either directly on their website or embedded right into their mobile application. The solution was developed by four Irish designers and engineers, and Intercom as a company was founded in 2011. The original goal of the platform was to develop a support solution that models the intimacy of a local coffee shop, providing truly personalized service to every visitor and prospect. After a brief struggle to find funding in the U.S., Twitter co-founder Biz Stone invested in Intercom only one year after their initial founding, back in 2012. 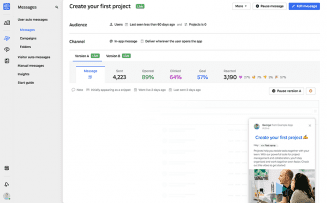 Intercom’s platform has since grown to include a messaging platform to send targeted notifications and messages to leads, an inbox to manage and respond to all customer inquiries as a team, and a knowledgebase for self-service support. Intercom offers one of the most compelling live chat support solutions on the market. Whether your business is looking to capture and convert leads, onboard and engage customers, or support and retain customers, Intercom has a solution that should fit your needs. Intercom’s three product offerings can be purchased separately or combined together into one platform to offer even more functionality. For example, if your business simply needs a live chat addition on their website, then the Inbox solution is all you need. 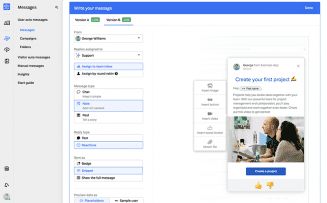 In fact, Intercom’s Inbox solution is a very compelling live chat platform, with a centralized team inbox, multi-channel support, an operator bot to assist customers and route inquiries to agents, automated workflows, and customer profiles with lead scoring. Embeddable directly into your business’ website or mobile application, Inbox offers your customers the ability to directly chat with a representative in real-time. With an Operator Bot working as your first line of defense, customers are able to provide context in order to help agents resolve their inquiry even faster. A centralized team inbox enables agents and representatives to manage and respond to every single conversation and interaction with leads and users, from one location. 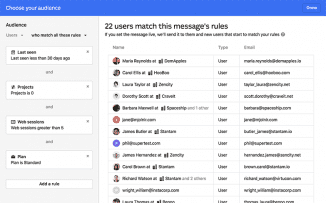 The team inbox also supports multiple channels, and the entire platform even integrates with social media platforms like Facebook and Twitter, enabling agents to see and reply to both Facebook messages and Twitter DMs directly inside the team inbox. The inbox also provides customer profiles, which provides greater context to agents, allowing them to see exactly who they are talking to with including information like their location and website activity. 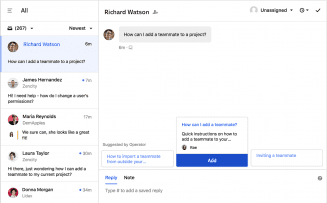 Intercom’s Inbox solution also allows for automated workflows, enabling canned responses to common questions or even personalized responses to specific users. 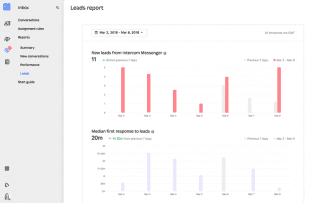 Businesses can also score their leads, view leads captured over time, integrate directly with Salesforce and other CRMs, and even track different lead sources in order to understand which messages generate the most leads. Overall, the platform includes the tools to not only service your customers and generate new leads, but also the features necessary to understand how well the service is working, and how to optimize for efficiency. What Do You Think of Intercom?